Google search, 'Haiti' and 'Haiti evaluation' on www.americares.org. AmeriCares Foundation. About us. http://www.americares.org/aboutus/ (accessed January 17, 2011). Archived by WebCite® at http://www.webcitation.org/5voLwmdYe. AmeriCares Foundation. AmeriCares Haiti projects and spending, February 2011 (PDF). AmeriCares Foundation. AmeriCares relief worker blog from Haiti. http://www.americares.org/newsroom/voices-from-the-field/relief_worker_b... (accessed January 17, 2011). Archived by WebCite® at http://www.webcitation.org/5voQfDBSU. AmeriCares Foundation. Annual report (2009) (PDF). AmeriCares Foundation. Annual reports. http://www.americares.org/newsroom/publications/ (accessed January 17, 2011). Archived by WebCite® at http://www.webcitation.org/5voNxmJCH. AmeriCares Foundation. Haiti earthquake one year special report (2011) (PDF). AmeriCares Foundation. Consolidated financial statements (2009) (PDF). AmeriCares Foundation. Haiti one year anniversary recovery report. http://www.americares.org/newsroom/news/haiti-one-year-anniversary.html (accessed January 17, 2011). Archived by WebCite® at http://www.webcitation.org/5voMX3TuO. AmeriCares Foundation. Home page. www.americares.org (accessed January 17, 2011). Archived by WebCite® at http://www.webcitation.org/5voLnARmM. AmeriCares Foundation. What we do. http://www.americares.org/whatwedo/ (accessed January 17, 2011). Archived by WebCite® at http://www.webcitation.org/5voLzIII6. AmeriCares Foundation. Where we work. http://www.americares.org/wherewework/ (accessed January 17, 2011). Archived by WebCite® at http://www.webcitation.org/5voM39XEF. Porstner, Donna. AmeriCares Communications Manager. Email to GiveWell, February 11, 2011. Porstner, Donna. AmeriCares Communications Manager. Email to GiveWell, February 16, 2011. Porstner, Donna. AmeriCares Communications Manager. Email to GiveWell, February 25, 2011. As of June 30, AmeriCares has received &dollar;15,200,000 in private donations: &dollar;8,000,000 from individuals, &dollar;6,200,000 from corporations, &dollar;600,000 from founda-tions and &dollar;400,000 from other sources. AmeriCares has spent &dollar;2,700,000 on grant support, procuring additional relief supplies, shipping and logistics, staff-ing, securing a warehouse where we distribute medi-cal assistance throughout Haiti and establishing an office in Haiti to continue our response efforts over the next three to five years. In addition, AmeriCares has delivered and distributed close to &dollar;30,000,000 in medical assistance to more than 60 health care facili-ties and supported over 190 volunteer medical teams traveling to Haiti to treat patients." InterAction 2010, Pg 18. 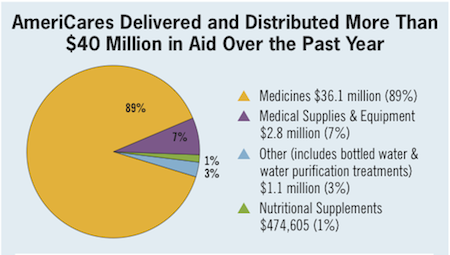 Where the money went: &dollar;40-million worth of donated medicine and medical supplies distributed to more than 75 health-care facilities and provided to more than 200 volunteer medical teams." Chronicle of Philanthropy, "Haiti Earthquake Fund Raising, One Year Later." "AmeriCares has delivered over &dollar;40 million in aid to Haiti to help survivors since January 12, 2010." AmeriCares Foundation, "Haiti One Year Anniversary Recovery Report." This message was published January 5, 2011. "To date, AmeriCares has delivered over &dollar;40 million in aid to Haiti earthquake survivors, yet has only spent &dollar;4.8 million because of our gift-in-kind model." Donna Porstner, email to GiveWell, February 11, 2011. "Our Haiti fundraising total as of February is &dollar;16.2 million." Donna Porstner, email to GiveWell, February 25, 2011. Donna Porstner, email to GiveWell, February 11, 2011. AmeriCares Foundation, "AmeriCares Haiti Projects and Spending, February 2011." AmeriCares refers to this list as "the complete list of our Haiti projects." Donna Porstner, email to GiveWell, February 16, 2011. &dollar;2,511,419. AmeriCares Foundation, "AmeriCares Haiti Projects and Spending, February 2011." AmeriCares Foundation, "Haiti Earthquake One Year Special Report (2011)," Pg 1. AmeriCares Foundation, "Annual Report (2009)," Pg 9. AmeriCares Foundation, "Annual Report (2009)," Pg 19. Delivered more than &dollar;1 billion in medical assistance, reaching over 270 health care partners in 92 countries through our Global & Domestic Medical Assistance, Emergency Response and Medical Outreach Programs. Responded to 32 emergencies in 22 countries, helping hundreds of thousands of people affected by natural disasters, disease outbreaks and civil unrest. Supported 952 medical volunteer trips to 79 countries through the Medical Outreach Program, providing over &dollar;35 million in medicines and supplies to enable the delivery of free health care services. Opened a distribution hub in Mumbai, India to deliver critical aid during emergencies and respond to ongoing medical needs in India, Asia and Africa with greater speed and effi ciency. Provided &dollar;20 million in medicines and medical supplies in the United States to support health clinics serving the uninsured and underinsured through the Domestic Medical Assistance Program. Filled over 215,000 prescriptions through our Patient Assistance Program, providing free medications for Americans with acute and chronic conditions. Increased patient visits at AmeriCares Free Clinics to over 9,000, providing primary care, diagnostic and specialty services for uninsured residents in Connecticut. Treated over 30,000 patients at the AmeriCares Family Clinic in El Salvador with comprehensive medical services and health education programs." AmeriCares Foundation, "Annual Report (2009)," Pgs 4-5. AmeriCares Foundation, "Annual Report (2009)," Pgs 6-7.